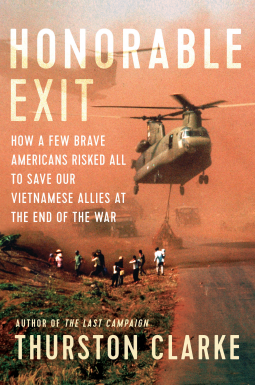 Thurston Clarke begins Honorable Exit by describing the iconic photograph of the Fall of Saigon: desperate Vietnamese scrambling to board a helicopter evacuating the last American personnel from Vietnam. It is an image of U.S. failure and shame. Or is it? By unpacking the surprising story of heroism that the photograph actually tells, Clarke launches into a narrative that is both a thrilling race against time and an important corrective to the historical record. For what is less known is that during those final days, scores of Americans--diplomats, businessmen, soldiers, missionaries, contractors, and spies--risked their lives to assist their current and former translators, drivers, colleagues, neighbors, friends, and even perfect strangers in escape. By the time the last U.S. helicopter left Vietnam on April 30, 1975, these righteous Americans had helped to spirit 130,000 South Vietnamese to U.S. bases in Guam and the Philippines. From there, the evacuees were resettled in the U.S. and became American citizens, the leading edge of one of America's most successful immigrant groups.